I recently worked with Forever Queen for a project and they were awesome from the get go. Absolutely lovely guys with brilliant communication which is a very underestimated trait. Their quality as musicians was fantastic with amazing stage presence. Their professionalism as a band is great and they sure know how to put on a memorable gig. You’d be hard pressed to find a better Queen tribute in the UK! I just wanted to say thanks for the excellent show last Saturday as part of the Didcot Live Special. You guys put in a brilliant performance and had the crowd up and dancing and generally having a brilliant time with feedback such as “the band was amazing” and “a great night of live music – get them back!” nicely summing up the comments from the audience! I’ll certainly look forward to working with you again and getting you back for another night! Many thanks indeed to you and the whole band for a fantastic performance on Saturday night. I know we are indeed very lucky to get you to perform for us and of course from what Simon and you told me things are really taking off for you in the Portsmouth area which is brilliant news. We are very grateful to you all for giving up your time and helping us raise our profile and much needed funds for our work. Our young people thoroughly enjoyed it too! As I said on the night it was unfortunate that the actual home match was postponed due to a waterlogged pitch as it meant that some of the supporters and team did not come in and stay for the evening. We are still waiting to hear from the club on the final donation and so I am unable to come back with a total raised at this point but they were very generous on the night so I am hoping we will make as much as the last performance at The Keystone. I will come back to you with the total in due course. It’s amore!!!!!! kind of magic for sure! This evening we soaked up the energy and loved the vibe as Forever Queen set The Old House At Home moving to the legendary sounds and awesome beats. Thanks, It was a great night last night and seemed to be enjoyed by all. Amazing gig at Vitalise Netley on Sunday, our guests, volunteers & staff are still talking about how great it was. FOREVER QUEEN YOU GUYS ROCK!! Amazing! Thank you! We will make sure we let everyone know what a great night is was. 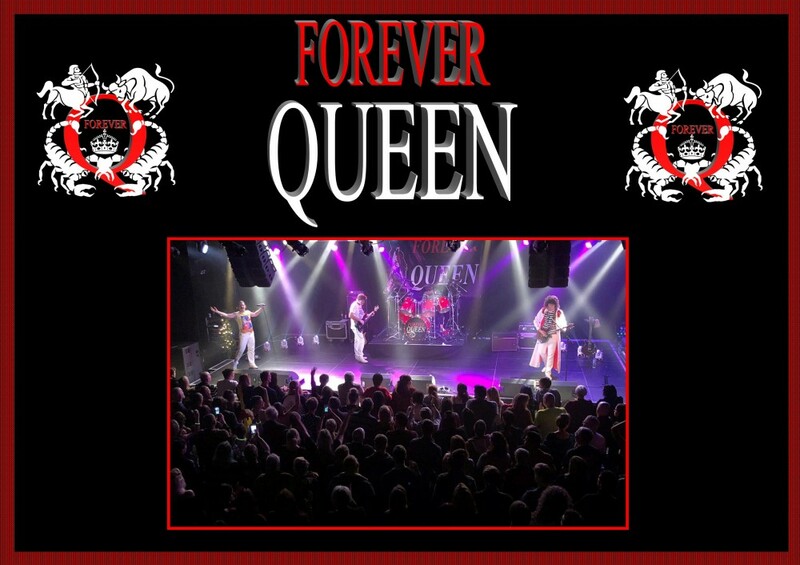 Real Live Events can report Forever Queen gave us a great show here on the Isle of Wight – very easy to work with, friendly, professional – 100 % commitment rig…ht down to the expensive wigs! We would happily have them back – the audience danced and sang away with abandon. A pleasure. Will recommend to others at the drop of a hat. Dee doo dar day indeed! I hope you all got home safely yesterday. Thanks for coming to perform at our festival. Everyone thoroughly enjoyed the show and as I said, we’d love to invite you back in future.